It's snowing in space! Well, not really — but astronomers are calling this colorful nebula a "winter wonderland." 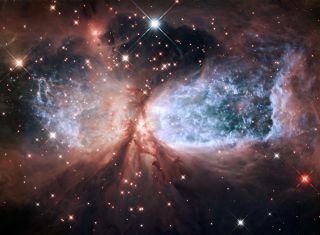 With that frosty blue hue and flurries of stars speckled across cosmic clouds, this wintry nebula is simply stunning. Read the full story here. Two festive nebulas, known together as NGC 248, shine as one in this colorful photo captured the Hubble Space Telescope and released by NASA on Dec. 20, 2016. The data to make the image was recorded by Hubble in 2015, NASA says. Read the full story here. This view looks toward the anti-Saturn side of Titan (3200 miles, 5150 kilometers across) and Dione (698 miles, 1123 kilometers across). North is up on the moons. This view looks toward the northern, sunlit side of the rings from just above the ring plane. The image was taken on May 21, though released months later. The crater at the center of this image is named Dickens, after Charles Dickens, the English novelist who lived from 1812 to 1870. Among Dickens' famous works is A Christmas Carol, the story of Bob Cratchit, his family, and horrible boss Mr. Scrooge. Scientists studying Mercury might consider the Mariner 10 mission to be Christmas Past, Messenger to be Christmas Present, and the European Bepi-Colombo mission to be Christmas Yet To Come. This photo was taken by NASA's Messenger probe orbiting Mercury and released on Dec. 21, 2011. The colorful globe of Saturn's largest moon, Titan, passes in front of the planet and its rings in this true color snapshot from NASA's Cassini spacecraft released on Dec. 22, 2011. The north polar hood can be seen on Titan (3200 miles, 5150 kilometers across) and appears as a detached layer at the top of the moon here. This view looks toward the northern, sunlit side of the rings from just above the ring plane. Images taken using red, green and blue spectral filters were combined to create this natural color view. The images were obtained with the Cassini spacecraft narrow-angle camera on May 21, 2011 at a distance of approximately 1.4 million miles (2.3 million kilometers) from Titan. Image scale is 9 miles (14 kilometers) per pixel on Titan. With the holiday season in full swing, a new image from an assembly of telescopes has revealed an unusual cosmic ornament. Data from NASA's Chandra X-ray Observatory and ESA's XMM-Newton were combined to find this young pulsar in the remains of a supernova located in the Small Magellanic Cloud. It is be the first definite time a pulsar, a spinning, ultra-dense star, has been found in a supernova remnant in the SMC, a small satellite galaxy to the Milky Way. The pulsar, known as SXP 1062, is the bright white source located on the right-hand side of the image in the middle of the diffuse blue emission inside a red shell. The diffuse X-rays and optical shell are both evidence for a supernova remnant surrounding the pulsar. The optical data also displays spectacular formations of gas and dust in a star-forming region on the left side of the image. Saturn's moon Tethys, with its stark white icy surface, peeps out from behind the larger, hazy, colorful Titan in this Cassini view of the two moons released on Dec. 22, 2011. The north polar hood can be seen on Titan appearing as a detached layer at the top of the moon here. This color image of the region known as NGC 2264 — an area of sky that includes the sparkling blue baubles of the Christmas Tree star cluster and the Cone Nebula — was created from data taken by the Wide Field Imager at ESO's La Silla Observatory in Chile. The image shows a region of space about 30 light-years across. This image was released on Dec. 16, 2008.